There’s a common misconception among entrepreneurs and small business owners that because of their company’s size, they lack the time and financial leeway to hir0e, train and pay interns. Bridget Grenier, the HR director at Vector Windows, would beg to disagree. Vector Windows is a small manufacturer in Fergus Falls, Minnesota. Founded in 1995 under the name Vinylite Windows, Vector has since established itself as an active participant within the Greater Minnesota manufacturing and STEM communities. The company is a member of TSMA and has offered paid STEM internships since 2015. SciTechsperience was conceptualized by the Minnesota Department of Employment and Economic Development (DEED) and exists as a free entrepreneurial resource, designed to help small companies, like Vector, easily find and pay college interns. Companies that hire students through SciTech receive a 50 percent wage reimbursement at the end of each internship, up to $2,500, per intern hired. Since the program’s founding in 2012, small businesses across the state have benefited from hosting over 1,290 paid internships, each one its own unique experience. Participating companies not only choose who they want to hire but decide what they want their intern to accomplish. For Vector Windows, their approach to hosting a successful internship begins with finding the right person to join their team. “First and foremost, we look at a cultural fit. If the intern doesn’t fit our culture and our Vector values, it probably won’t work out for either party,” said Grenier. 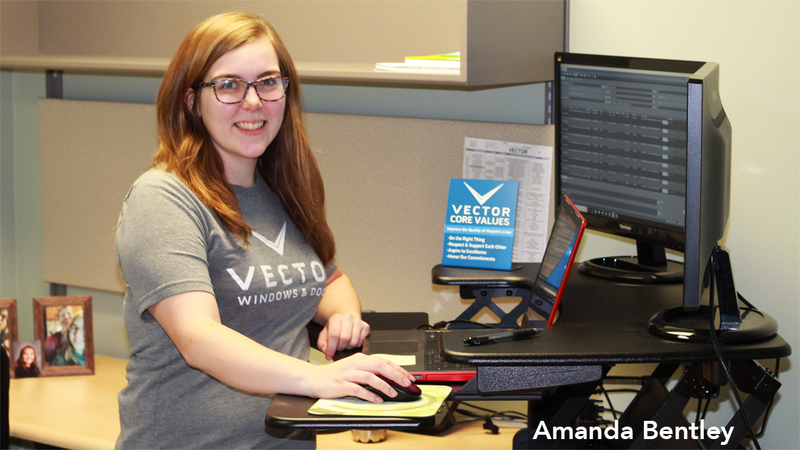 Bentley was pursuing a mathematics major at Bemidji State University when she started her internship with Vector windows in late May of 2018. Like all SciTechsperience interns, Bentley was pre-vetted and approved for the program due to her above average GPA and industry related studies. When she came to Vector Windows, Bentley was already proficient in C++, Java, and Python programming languages, having also created various mathematical models using Minitab statistical software and Microsoft Excel. “My main responsibility [as an intern] was to improve our business system by utilizing all aspects of our software and supporting our customers’ requests for changes,” Bentley recalled. Some of her other projects included creating new images of Vector products with true-to-life proportions and details, simplifying the ordering process by adding more intuitive features, and configuring an application for customers to be able to order bay and bow windows through their online accounts. Vector saw value in the quality of work Bentley was producing and, towards the end of her internship, approached her with a newly created position, matching her skillset to the business’s needs. Now employed as a business systems analyst, Bentley primarily works with Vector’s FeneVision, a business system used to manage their manufacturing operations. Bentley is also leading the development of improvements for Vector’s order entry portal. Going on four years now, Vector has utilized internships like Bentley’s as a fluid pipeline for finding dedicated and passionate long-term talent. With the financial support from SciTechsperience, there’s no easier way to connect with the extra help that all small businesses need. At least 350 wage matches are available through August of 2019. To learn more about SciTechsperience and apply online today, visit www.scitechmn.org.